Prince Charles and Lady Diana tie the Knot! Home » All society » Prince Charles and Lady Diana tie the Knot! For many years, the world was wondering when and if the Prince of Wales was ever going to marry and give the British People and the Monarchy some good news. Prince Charles was the most eligible bachelor in the world, and rumours were all around about who might be the “lucky” lady, that would be the next Princess to be and be with her husband the next in line to the throne. Well on this day in 1981, Prince Charles indeed had the whole world buzzing as he and Lady Diana Spencer were wed in St. Paul’s Cathedral in England. To say that this event was the most watched would be and understatement. Billions of people all over the world were captivated and glued to their television sets as Lady Diana looking ever so lovely made her way up the stairs of St. James Cathedral, to take the vows that would make Charles a married man and first in line to succeed Queen Elizabeth. She had a smile that could capture your imagination and being tall and graceful, she never was out of the camera’s lenses for long, once her engagement to Charles was announced. The photographers of all the tabloids around the world would hound and pester Diana before she married and afterwards hounded her even more. Charles and Diana became parents to two beautiful boys. William born in 1982 and Harry born in 1984. The young family was always in the limelight, to the delight of the British people and many all over the world. Unfortunately, the pressures of married life under the spot light weighed heavily on this marriage and after 10 years of marriage, they like so many other couples separated. By 1996, Diana and Charles divorced. All of this happened under the watchful eye of the media. Every move, every sighting made by Charles or Diana, brought out the gossip about what was going on in their lives. Every move they made was fodder for the common folk, and every time one was spotted with someone else, the tabloids were filled with innuendoes. Diana tried to rise above all that, by become spokesperson for many charities, especially ones that involved children. While she gave up the idea of becoming Queen in the future, she had risen in the estimation of the world and became Queen of many hearts, the People’s Hearts. For Diana, life outside the palace was as difficult as life within. From the time of her divorce from Charles in 1996, till that fatal day in August of 1997, Diana was pestered by paparazzi. There was nowhere that she could go, where there weren’t “eyes” watching her every move. Tabloid spreads were common and sold many, many newspapers in England and abroad. 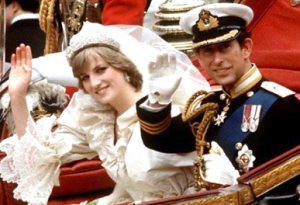 As many people who watched the wedding of Charles and Diana, remember that fateful day on August 31st, when trying to flee tailing cameras, the Princess, along with her friend Dodi Fayed and her driver were in a fatal car accident. Speculation was abounding about what had happened. Suggestions were made that Diana was targeted, so that Prince Charles could marry again. In the end her driver was found to be intoxicated, causing the deadly crash. The world mourned the loss of Diana, and felt so sorry for the two young Princes. A lot has happened since those years, but everyone remembers well the beautiful smile on the face of Princess Diana and she will remain an icon of what could have been, for years to come. If you want to relive that beautiful day in the lives of Charles and Diana there are many videos that will take you right back to those moments that we all remember so well…..